Since we are a leading provider of RF over Fiber & Optical Delay Line solutions, it is a given that we will attend the upcoming IBC 2017 in the RAI in Amsterdam. This leading media, entertainment and technology show allows us to meet existing and new customers to inform them about our latest offerings. Our RFoF and ODL solutions are already used by Tier 1 and other enterprises active in the broadcast, audio and video sector as well as in the telecom, aerospace, governmental, and research labs industries. They opt for our RF over Fiber modules (RFoF) since these are suitable for any application where cables are not sufficient, especially when high performance is required. Our RFoF products are programmable and offer the best cost performance ratio, featuring noise figure of 6dB and gain link of around 40dB. Click here to find out more. 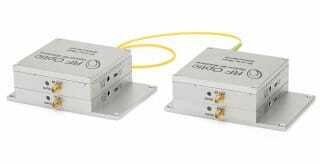 Our innovative compact bidirectional (2 way) RF over Fiber (RFoF) transceiver is comprised of an uplink of Tx and Rx (at 1550nm) and a downlink of Tx and Rx at 1310nm. The transceiver employs WDM technology to use only 1 fiber link instead of 2. These programmable bidirectional RF over Fiber (RFoF) units are especially suitable for remote antennas communication, Satcom, 4G LTE, and broadcast. Our controllable RF over Fiber (RFoF) OEM cards offer an excellent solution for companies who need to add an RF over Fiber capability to their portfolio. The cards are easy to customize to fit the specific requirements of an OEM and are designed to operate using a flexible DC supply voltage from 5 to 12 Volts. These small size analog RFoF cards, either Tx or Rx, come as a board with optical, RF connector and DC interface. A control/diagnostic port is available in a small size micro USB interface on board. Our programmable RFoF OEM cards are especially suitable for audio and video solutions that required RF over Fiber technology. Come meet us at IBC 2017, we will be there September 17 – 19, 2017. To schedule a meeting, contact Mr. Oz Abramson at oz@rfoptic.com or visit our website www.rfoptic.com. See you at IBC!